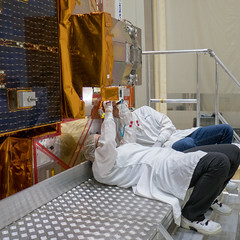 The Sentinel-2B satellite is set to be lofted into orbit by a Vega launch vehicle from Europe’s Spaceport in Kourou, French Guiana at 01:49 GMT (02:49 CET) on 7 March, and teams at ESOC, ESA’s mission control centre in Darmstadt, Germany, will be watching closely. Why is that, you may ask? 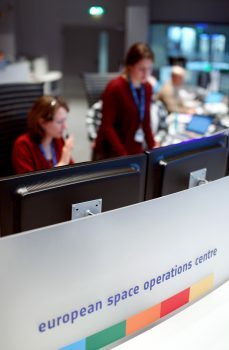 ESOC is home to the Sentinel-2 mission control team, who are flying both the -2A and -2B spacecraft throughout the mission’s routine phase (full details on dual-satellite Sentinel-2 operations). Most immediately, while continuing to fly -2A (which was launched in June 2015), the team will take over control of 2B just after separation from the Vega rocket, marking the start of the approximately three-day ‘LEOP’ – the critical launch and early orbit phase. During LEOP, the mission control team staffs the main control room 24 hours/day, overseeing a critical series of initial actions designed to bring the satellite into a stable operational mode, move it into its correct final orbit and fully check out the health and functioning of all systems. If you suspect that getting ready for LEOP involves a great deal of effort – you’d be right! Numerous teams at ESOC have been conducting intensive simulation training for a number of months, while putting the finishing touches on the mission operations ‘ground segment’ – the systems and netwoks on Earth used to control the satellites in space. A significant milestone in launch readiness was achieved last week on 6 February, 30 days before liftoff, with the Operation Readiness Review (ORR) conducted by the flight director, Pier Paolo Emanuelli, at ESOC, and co-chaired by the Sentinel-2B Project Manager, Francois Spoto; colleagues on the extended Sentinel project teams at ESTEC and ESRIN joined via video conference. Bianca Hörsch, the Sentinel-2 mission operations manager at ESRIN, and her team presented the readiness status of the mission’s ‘Payload Data Ground Segment (PDGS)’ – the systems and networks on Earth that receive Sentinel-2 data and transfer these to the final end-users – as well as the status of plans for in-orbit commissioning, status of the ground stations used to download data, and the status of readiness of for data processing, archiving and dissemination. Overall, the mission status was assessed as being ‘excellent’ and all the involved systems – the spacecraft, the launcher and the ground segment – and the teams are ready to support Sentinel-2B launch on 6 March, at 22:49 Kourou time. Sentinel-2B is GREEN for launch! Editor’s note: Access regularly updated photos from the launch campaign at Kourou and the simulation training at ESOC via Flickr.